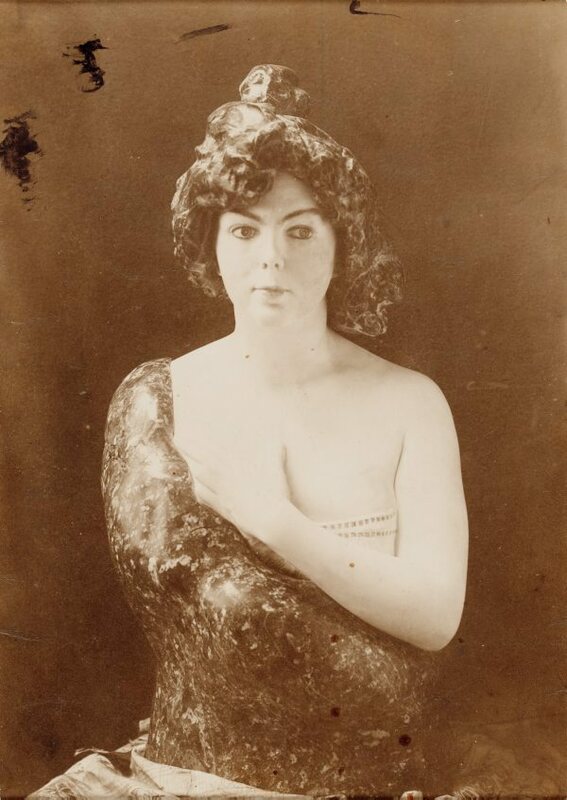 This photograph depicts a marble sculpture by German Symbolist Max Klinger (1857–1920). A painter, printmaker, sculptor and writer, Klinger influenced the Norwegian artist Edvard Munch and has been identified as a connective link between the Symbolist movement of the 19th century and the Metaphysical and Surrealist movements of the 20th century. While his work entwines a penchant for metaphysical anxiety with the fantastical it also presents an element of social criticism. Klinger counterbalanced a predilection for illusion with a concern for reality, often using his work as a framework to address societal issues including the plight of women, urban violence and poverty. The artistic output of his later career was dominated by sculpture. Much of his sculptural work, including this marble bust, projects an unsettling and eerie demeanour. With its pursed lips, raised eyebrows and furtive sideways glance the figure in this sculpture appears as if she were just about to spring to life in spite of the fact that half her torso is encased in a sheath of loosely shaped and globular marble. Elsa Asenijeff, the woman portrayed here, was a writer who was in a relationship with Klinger at the time he produced the sculpture.